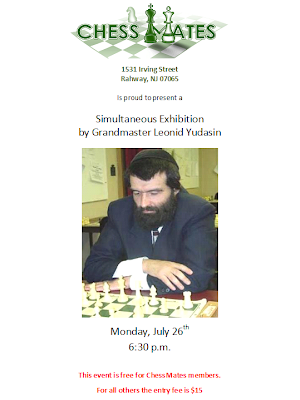 Tomorrow evening at Chess Mates in Rahway, GM Leonid Yudasin will be giving a Simultaneous Exhibition. The event, which will begin at 6:30 p.m., is free for Chess Mates members and $15 for all other participants. Ari Minkov lost to David Pawlowski and Lou Sturniolo last night but still holds a 2 point lead with 5 weeks to play. Mark Kernighan & I moved within 1 point of idle, 2nd-placed Ken Chieu by defeating Ian Mangion & Mike Wojcio. Greg Tomkovich stayed in contention with a victory over Pat Mazzillo. 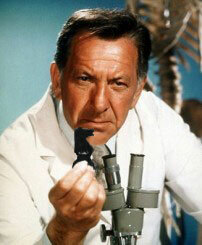 Joe Renna also won. Ari Minkov extended his lead to 2 points. Ken Chieu arrived late and could not get a game but held onto 2nd. Ian Mangion & I lost, enabling Mark Kernighan to grab a share of 3rd place. Ari Minkov had 2 wins and retained his 1 point lead over Ken Chieu. Ian Mangion, Steve Stoyko & Joe Demetrick also had victories. I lost a double-header to Chieu by missing a win in the opener & blundering my Q away in the nightcap. Ari Minkov scored just 0.5/2 vs.Mike Wojcio but extended his lead to a full point. I avenged my 2009 KST loss to Joe Renna and caught the absent, 2nd-placed Ken Chieu. Mark Kernighan, Ian Mangion, David Pawlowski, Greg Tomkovich, Geoff McAuliffe, Pat Mazzillo and Braeden Reinoso also had victories.